Home Food Recipes I have no idea what to call these, but they will knock your socks off. I have no idea what to call these, but they will knock your socks off. I need a name for these. Seriously, I don’t know what to call them. They are no grain, gluten free, paleo friendly (I think? ), calorie dense, snack bars with about 4 grams of protein each (if SparkPeople can be believed: I used their calculator). They are also like crack. Crack snacks? I dunno. Whatever you want to call them, I had one an hour ago and I’m still jonesing for another. I came up with these because I was looking to make something like Steve’s Original Paleo Crunch bars… which I ADORE (and which you should totally go buy because Steve has the best damn stuff and it’s for a good cause .. getting inner city kids working out and off the streets, yo) BUT I ran out of them and after putting gas in my car at Four-oh-my-god-the-wallet-is-screaming- dollars a gallon, there wasn’t much left in the kitty for schnacks. Now, you may think this is odd, but I actually did have all these ingredients in the house. I used my last 1/2 cup of almonds and almost all my honey but damn, it was totally worth it. These would be perfect, I think after an intense work out. Or maybe mountain climbing or other such vigorous exercise. I know I’ll be packing one (and only one) when we go to NYC on the train next time because the timing of those trips are such that I need a snack or my blood sugar starts to wane and then I’m Miss Crankypants until I can get myself a gyro from a street cart. I did some research around the internet and found several people had come up with one version or another. Lots of fancy nuts like cashews, macadamia nuts, hazelnuts.. etc etc. 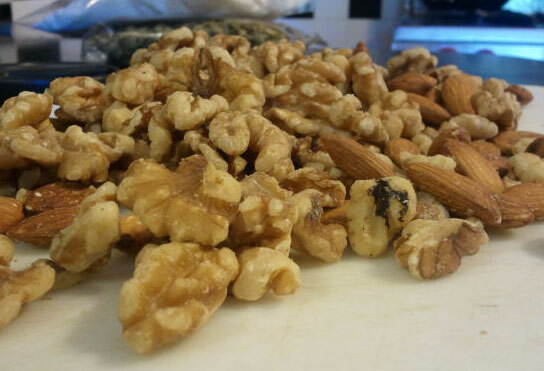 I have walnuts. Cheap. Healthy. Satisfying. So I used walnuts and they came out awesome. So with a little guidance an proportions from the internet (and freakishly as I’m typing this, I noticed someone pinned a recipe freakishly similar! 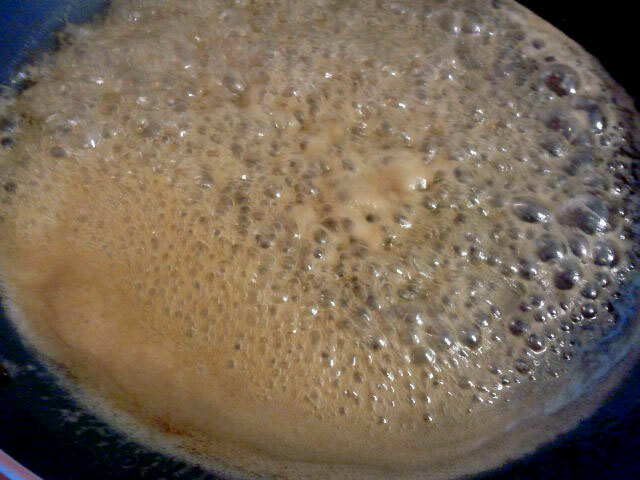 ), I give you..
Cook the butter and honey until bubbling. 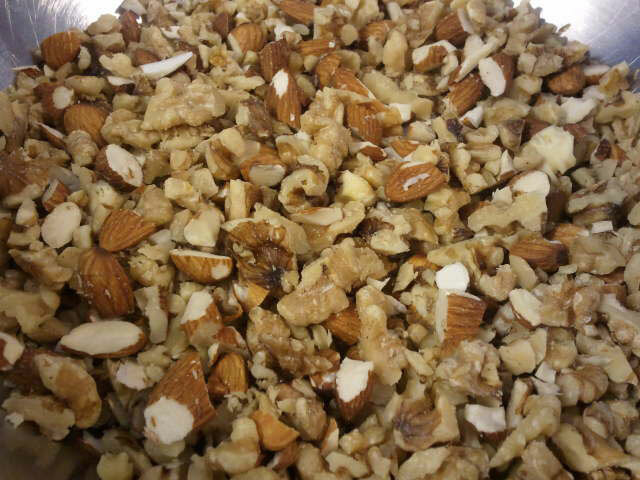 Pour the butter/honey mix over the top of your nut mixture, mix together and dump into an 8×8 pan lined with parchment. I cut these into 12 bars before I did the calorie/protein count etcetera… cut them into 16. Trust me. The middle of the batch was still a little soft, but I think it’ll firm up pretty well in the fridge. You are going to want to wrap these individually and store in the fridge so they stay kinda firm. 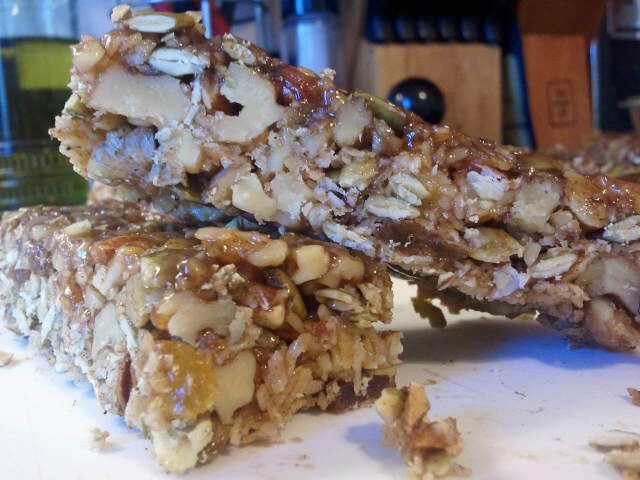 Grain Free, Gluten Free, Refined Sugar Free, Paleo Friendly Granola Bars... yes really. Bake in the over for 30 minutes, turning once ½ way through if your oven has hot spots. Let cool completely before turning out onto a cutting board. The original recipe had ½ cup of honey.. this was too much. Using only ¼ cup of honey sticks everything togther and you dont' have to wrap these individually. 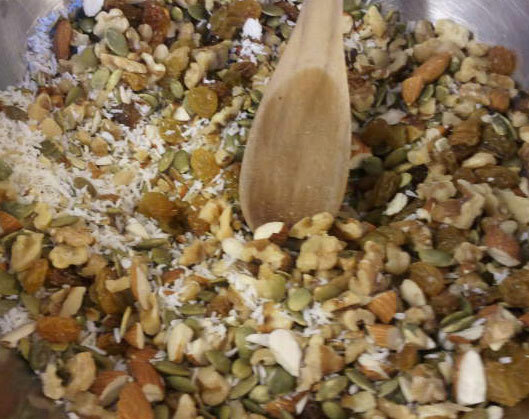 almonds, coconut, gluten free, grain free, honey, pumpkin seeds, raisins, snacks, walnuts. Bookmark. Poaching an egg in the microwave?